Fourth graders learn to divide using 1-digit divisors and up to 4-digit dividends. Students can have difficulty learning this process, but you can use the steps here to help them to understand. Math can be fun if you use several of the teaching aids that engage students with different learning styles - stories, writing, drawing, music and games. However, math needs to be more than fun - children need to understand the math facts and processes. Before introducing long division, students must know the multiplication table. During fourth grade, they'll build on this foundation when learning the division table. Using any or all of the fun teaching aids mentioned above can't totally replace old-fashioned memorization and drills, including flash cards and timed worksheets. Once your students know the multiplication table, you can introduce long division with 1-digit divisors. Have your students use graph paper. It's easier for students to learn correct placement of numbers when their paper helps them see the columns. Find a slogan to help them remember the steps to follow - divide, multiply, subtract and bring down. You might choose a concept reinforcing phrase, such as 'Doing Math Suits Brains,' or 'Doing Math Seems Brilliant.' Write your saying at the top of the board for marking each time you use a step. 3. Tell your students, 'We write the answer, 0, above the 4 in the dividend,' and do so. 4. 'The next thing we do is multiply.' Underline the M of the second slogan word. On the line below the 4 ÷ 9 = 0, write 9 x 0 = 0, placing the 9 below the 9 in the line above to aid students' visualization of the process. Draw an arrow to a point just to the left of where you'll write 0 under the 4, and draw the sum line under it. The arrow ties the steps you're taking to writing it in the problem. 5. Underline the S in the slogan, saying, 'Now we must subtract. 4 - 0 = 4.' Write the 4 in its place. 6. While underlining the slogan's B, state, 'Bring down means to copy the next number in the dividend by bringing it down next to the 4.' Draw an arrow from under the 4 to where it will be copied, writing the 4 in place. 7. Explain that you'll now start at the beginning of the slogan again, and will divide into the next number. Put another line under the D.
8. Repeat steps 2-7 until you've completed the problem. To the right of the problem, write 'Answer: 476' to visually complete the problem. Do another problem, again step-by-step, letting students tell you what to say and do at each step. Have your students do one problem on the board or on their own on graph paper with your oversight. Some will want to do certain steps in their head, but don't allow that yet. Tell them that soon they may do certain parts in their head. If they write everything out at this stage, it'll help you be sure they know what they're doing - and where they went wrong if a mistake occurs. It'll also cement the process more thoroughly in their minds. 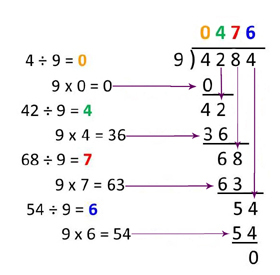 Once your students have done a number of problems on their own, teach them to check their work by multiplying the answer by the divisor. Make sure this answer is the same as the dividend. Once the children are doing these problems easily and accurately, ask them to do the multiplication steps without writing it out. When this has been mastered, they can do the division in their heads. When all of this has been accomplished, your students will have mastered long division with 1-digit divisors. 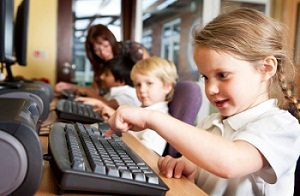 Suitable praise each time a student masters a step will encourage the learning process. Praise neat work as well as accurate work. Use stories, writing, drawing, music and games to reinforce the math facts for division. Check out the various storybooks, songs, manipulatives and other resources that are available.